Plus a link to the Web addresses for every college and university in the United States and Canada.COOL COLLEGES is the resource for finding your dream school-and gives you the edge you’¬?ll need to get accepted. 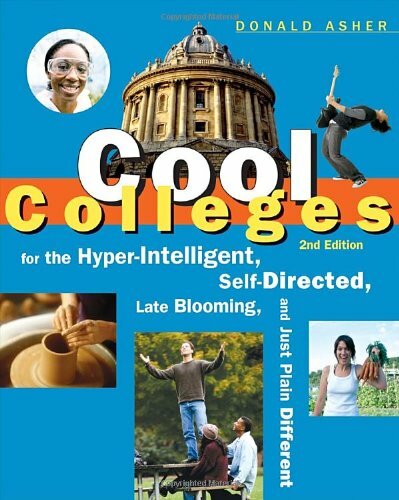 I received a used copy of your book, Cool Colleges (2nd Edition) in the mail this morning and (admittedly) out of vague interest and the slight boredom that comes with not having a driver’s license, I picked it up and went about my usual hole-up-in-my-bedroom-with-new-book-and-blinds-down-and-stay-holed-until-I-have-finished-the-text-in-it’s-entirety routine. The purpose of this message is to express my nearly inexpressible gratitude to you and your associates in research. I have read life-changing books, articles, and speeches but I have never, not once, been so deeply affected by a work of this type: A guidebook? I have perused U.S. News & World Report’s 2007 College Guide and the Newsweek/Kaplan 2007 College Guide, each with their individual talents and faults, but your book was different. For once I felt like the book was directed to students such as myself. I’m not an athlete and I’m no an academic superstar: at my school, that’s what it takes to be a favorite. I am just another mediocre teenager in millions who wants to save the world.